Trek duration: 8 Nights/9 Days (2 days by bus and 7 walking). 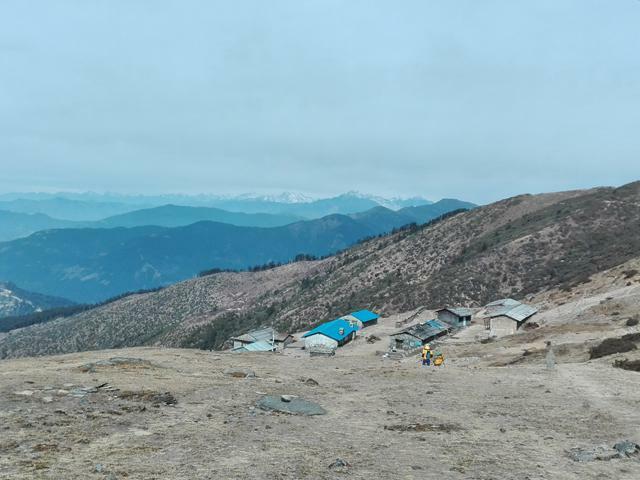 Trek start/end: At Jiri/Shivalaya and Phaplu Airport. Villages : Shivalaya, Bandar, Goli and Juni Besi etc. Trek style : Teahouse trek. Highest elevation: Pikey Peak 4067m. Ethnic group: Majority of Sharpas, Tamang, Jirel and Chhetris. Culture : Hundusim and Buddisum. Himalayan Scenery: Mt. Everest, Lhotse, Kanchenjanga, Makalu, Ama Dablam, Gari Shanker, Number Himal, Dhaulagiri and Annapurnas etc. 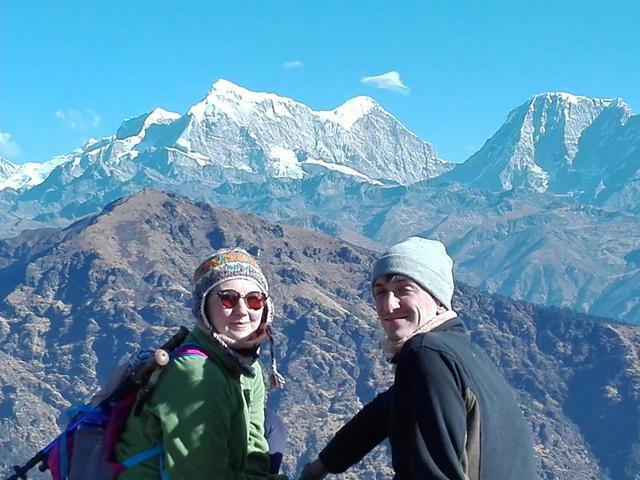 Trek price USD660 per person Matt and Grace (Numbur Himal on the background). Trek price USD660 per person Numbur Himal and Mt. Everest views from Pikey Peak. 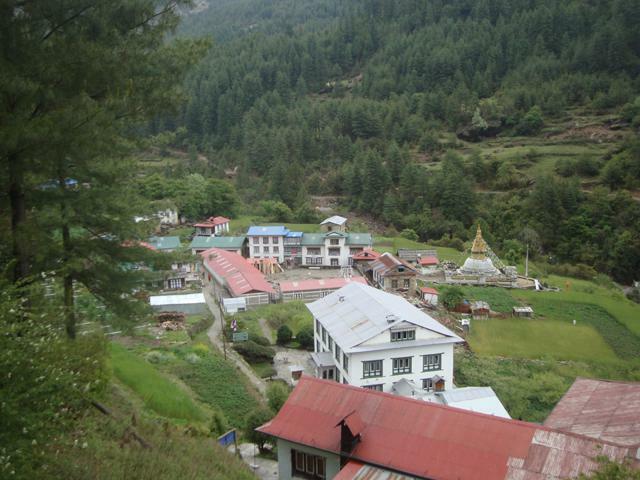 Trek price USD660 per person Teahouse at Pikey Base Camp. Pikey Peak Trek is a newly opened teahouse trekking route in the lower section of Everest region. 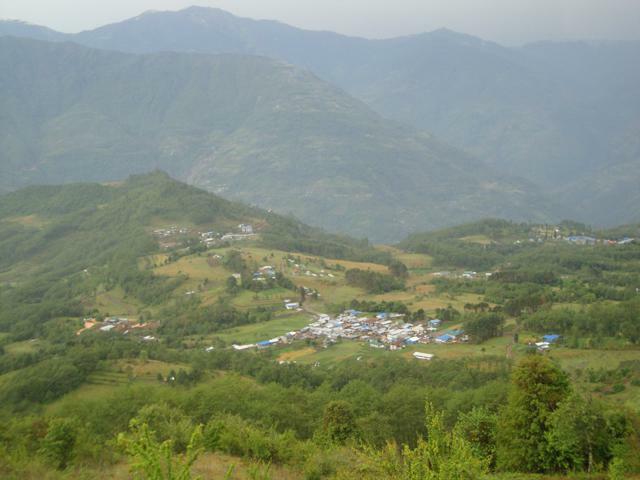 It is a remote area where you meet a few trekkers en-route. 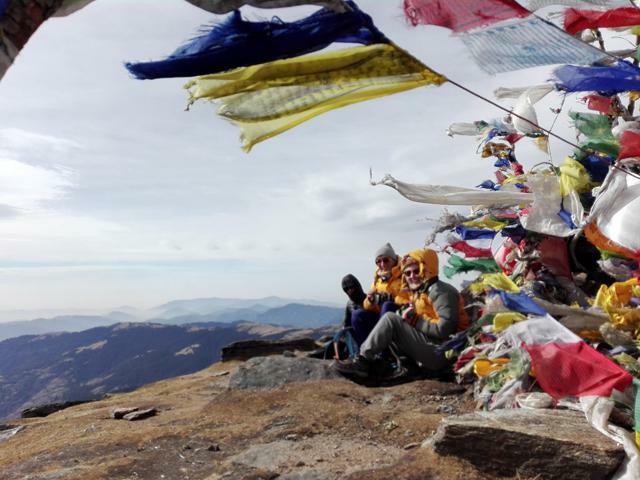 It is also the culturally rich trekking area where you can see ancient monasteries, Mani walls, Stupas, temples and Hindu pilgrimage places on the trek. It offers majestic views of Mt. Everest, Kanchenjunga, Makalu, Ama Dablam, Mera Peak, Gauri Shankar and Numbur Himal to the North and deep valleys dropping away into the clouds to the South from Pikey Peak. You can enjoy the breath-taking Sunrise and Sunset views from Pikey Peak at elevation 4067m. Sir Edmund Hillary said it is his favorite view of Mt. Everest (8848m) from Pikey Peak at elevation 4067m. We agree to him. The Sherpas believe that their clan god is living at Pikey Peak where the locals get to gather to worship and praying during the month of July. Dhudh Kunda is a scared Lake in the Base Camp of the mountain – Numbur Himal. The Shaman dance festival celebrates at the Lake in the full moon August each year. There can find 5 different types of Rhododendrons that bloom in the forest in April/May. This trek is also rich in Himalayan flora and fauna etc. You could see yaks grazing around Peak Peak. This trek begins with a bus ride from Kathmandu to Jiri to Shivalaya in a day. Then, trek to Pikey Peak is lined with villages, ancient monasteries, and breath-taking views of Himalayan scenery. 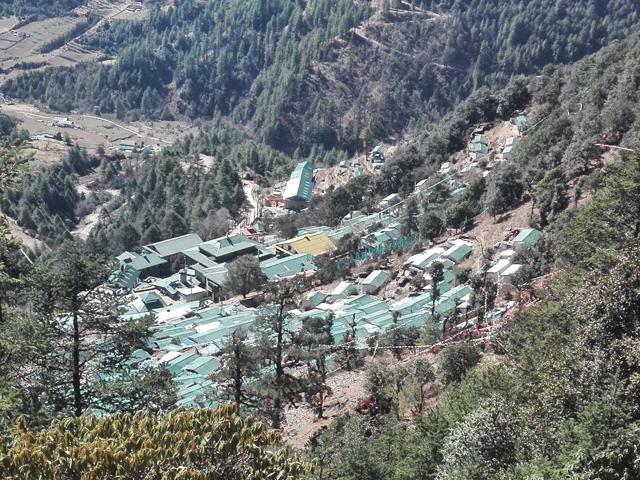 The trek ends at Phaplu – Saleri and travel to Kathmandu by flight or bus. It’s a drive in the scenic hilly region from Phaplu to Kathmandu by bus. There is direct flight operating from Kathmandu to Phaplu Airpot twice a week by Tara and Summit Air. Day 02: Trek preparation and visit Kathmandu. Day 03: Kathmandu to Jiri to Shivalaya by bus. Day 04: Trek from Shivalaya to Bandar 2190m/6hrs. Day 05: Bandar to Gumba Danda/Goli 2980m/7hrs. Day 06: Gumba/Boli to Pikey Peak Base Camp 3640m/5hrs. Day 07: Hike to Pikey Peak 4067m and to Jase Banjyang 3500m/2hrs. Day 07: Jase Banjyang to Juni Besi 2700m/5hrs. Day 08: Visit Thupten Choling Monastery and bac to Juni Besi 3-4hrs. Day 11: Phaplu - Saleri to Kathmandu by bus. Day 13: International Airport departure. Do you have any questions about Pikey Peak (Cultural) Trek? Or, would you like to see how it can be customized to your needs? Please DM us. The following cost and date are for per person for online booking. If the Pikey Peak (Cultural) Trek fixed departure dates do not match for you, please DM us and we will happily customize your trip on the date that you need. Kathmandu to Jiri to Shivalaya by public bus. Teahouse meals for clients: 9 Breakfasts, 9 Luches and 8 Dinners with tea/coffee etc. Meals can be selected from menu and will have enough daily. Trekking staffs: an experienced guide and porter. Salary and meals for guide and porter. Inusrance of guide and porter. Please read carefully cost includes and does not include above. All the meals are included with tea or coffee while on the trek. We do not include drinking water or boil water which you can buy at teahouse; it is $1 to 3 per liter. You can take water purified tablets or Seripen for a cheaper solution. Wi-Fi, battery charge and hot showers are not included. Battery charge is $1 to 5 per hour per device (you can take power bank for a cheaper solution). The gas shower is USD3 to 5 per head. We include public bus tickets for traveling to trail head and back to Kathmandu. If you prefer traveling by private jeep or flight, you have to top an additional cost on package. We do insure for trekking staffs and provide warm enough equipment. We do our best for your safety as well. Although we suggest you buy comprehensive travel Insurance that can cover flight cancellation, medical treatment, and Helicopter rescue emergency evacuation. Please buy the policy that can cover for trekking activity up to 4500m for the days you will actually be trekking. Trekking eqipment list for Pikey Peak Trek. Fleece jacket, three T-shirts, two trekking trousers, two drip-dry T-shirts, a woolen/fleece hat, glove, water/windproof jacket and trouser, Sunglass, lip balm, Sun screem (50+), Sun hat, a light scarf, soap/shampoo and trekking towel etc. A down Jacket, one long underwear and snow gaiters for the winter trip from January to February. 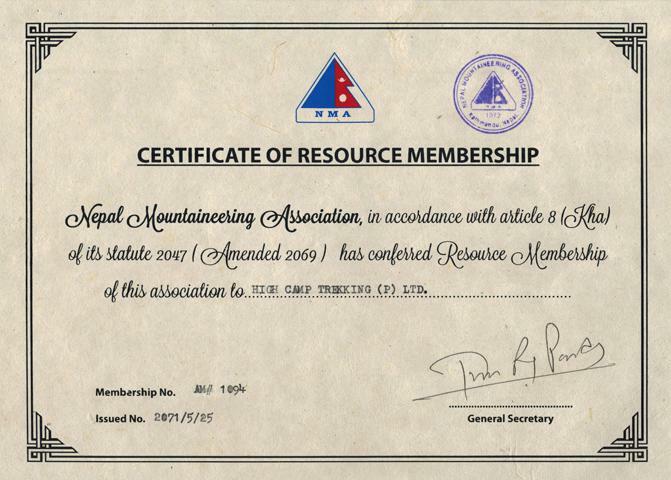 We are registered on the Nepal Government offices and have authority to operate trek and climb in the Himalayas of Nepal. We are the Taxpayer to Nepal Govt. We are healthy and up to date a local trekking agency based in Kathmandu. We response to every email/inquiry in less than 24 hours. You can call us anytime at +977-9841876395 (24 hours support team).